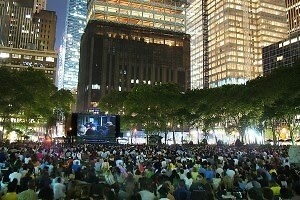 Summer in Manhattan means free movies in various parks scattered throughout the city. 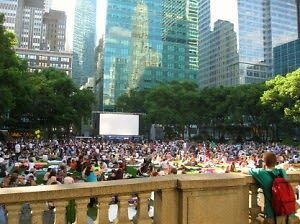 We've compiled a list movies that will be screened throughout the summer by location so you can plan a night in the park enjoying screenings of fan favorites and movie classics with your closest friends and hundreds of strangers (we swear it's fun)! Date: Friday, June 15, 2012, French Film "The War of the Buttons, Le Guerre Des Boutons"
Monday, June 18, 2012 "Psycho"
Monday, June 25, 2012 "Butch Cassidy and the Sundance Kid"
Monday, July 2, 2012 "The Wizard of Oz"
Monday, July 9, 2012 "On the Waterfront"
Monday, July 16, 2012 "Roman Holiday"
Monday, July 23, 2012 "The Maltese Falcon"
Monday, July 30, 2012 "Rebel Without a Cause"
Monday, August 6, 2012 "The Adventures of Robinhood"
Monday, August 13, 2012 "All About Eve"
Monday, August 20, 2012 "Raiders of the Lost Ark"
Other things you should know: No chairs, tables, dogs, tarps, or bags permitted. Also all bags, briefcases, and backpacks will be inspected before entering the lawn. Wednesday, July 11, 2012 "Moneyball"
Wednesday, July 18, 2012 "Super 8"
Wednesday, July 25, 2012 "Bridesmaids"
Wednesday, August 1, 2012 "Limitless"
Wednesday, August 8, 2012 "Cowboys and Aliens"
Wednesday, August 15, 2012 "Crazy, Stupid, Love"
Wednesday August 22, 2012 "Horrible Bosses"
Wednesday, July 11, 2012 "Cruel Intentions"
Wednesday, July 18, 2012 "Raising Arizona"
Wednesday, July 25, 2012 "Dirty Dancing"
Wednesday, August 1, 2012 "Princess Bride"
Wednesday, August 8, 2012 "Top Gun"
Wednesday, August 15th, the audience gets to choose between: Showgirls, The Goonies, The Lost Boys, Beetlejuice, Scream, Pee Wee's Big Adventure, Fast Times at Ridgemont High, and Empire Records. To vote click HERE! 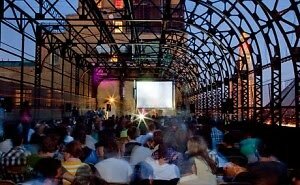 What you should know: The gates open at 6:00, bands start at 6:15 and the movies begin at dusk. 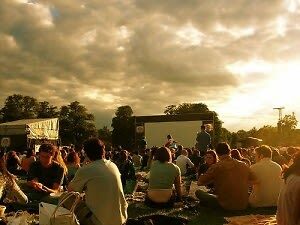 You should bring chairs or something soft to sit on as these movies take place on hard ground within the park.